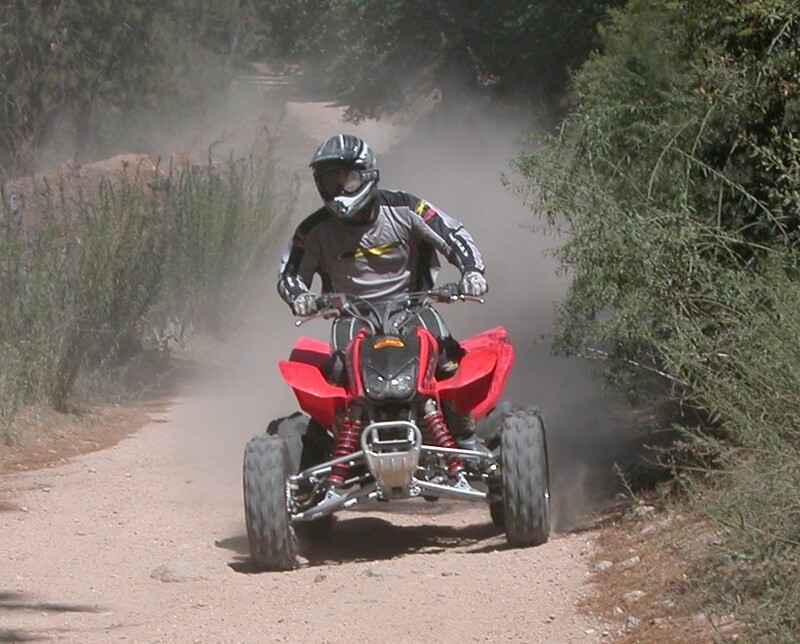 Which ATV is the better trail rider? We know the Honda TRX450R and The Yamaha YFZ450 are killer racers, but today where not racing! First off these two quads have cool eye appeal. The bright Honda red with black is a great combo of colors and the new non-traditional plastics (bolt on fenders) have aggressive looks. The Yamaha With its blue or white plastics is just what you expect from Yamaha. This quad looks like it’s flying when standing still. "We would have to say it’s a push/tie in looks." All 4 of our riders preferred the comfort of the Honda when sitting and standing while riding. With the Yamaha, You feel the bars sit a little low and your leaning forward slightly. Also, with the taller riders, you feel your knees are riding high when sitting on the ATV. "advantage to the TRX450R*"
The Honda suspension works good and It will absorb bumpy terrain and the jumps better then the YFZ. The Honda Also felt good when air born as did the YFZ. You can adjust the TRX450R shocks and feel the difference. On the Yamaha it is a little stiffer ride and when we tried to adjust the shock we didn’t feel much of a difference. "give this one to Honda as well. *"
The Yamaha YFZ450 feels wider then the Honda and it’s a plus when ripping around and getting sideways. 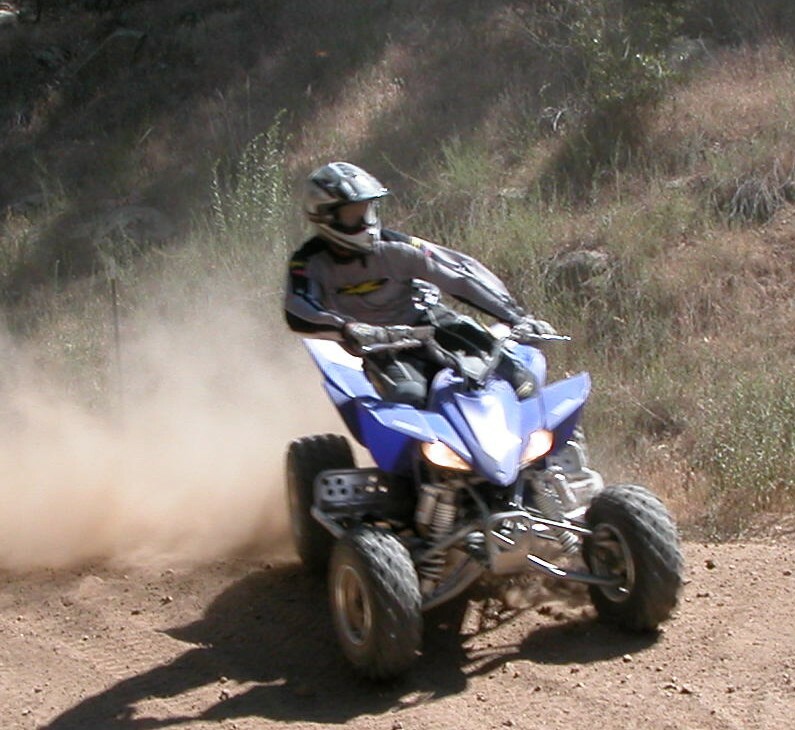 We all felt we were faster and in control when on the gas with the YFZ450. The Honda on the other hand, You feel a little squirrelly and on the edge. "Yamaha gets this one"
Both of these ATV’s have good power. We radared both quads on the dry lake bed at El Mirage, CA @ 2500ft elevation and they both had the same top speed 69.9mph. 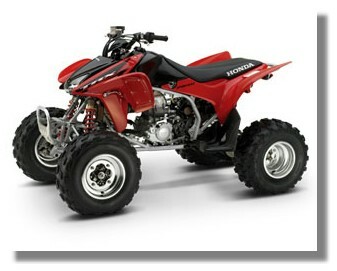 But, 3 out of 4 of riders preferred the TRX450R bottom end response and mid range power over the YFZ450. "So Honda pulls out another *"
Its great that Honda was thinking of the Racer when coming out with this kick start ATV and trying to save weight. The Honda usually kicks over on the first kick. But, every once in a while you have to kick a few times to start. And 3 out of 4 did not like It. A benefit of kick starting, is never having to worry about your battery. But there where certain condition when you would accidentally stall the TRX450R and if you where racing, it would be a problem. I don’t know if we ATV riders are getting lazy, but it is a luxury to hit that start button and your engine fires. Plus when you are racing around on the trails and you stall the YFZ you can fire it back up with in seconds. "The YFZ nailed this one." Both of these ATV’s weighed the same @ 350lbs and both had a 5-speed trans. "Push"
Honda has a slightly larger tank with a 3.2 U.S. gal verses the YFZ 2.6 U.S. Gal. " 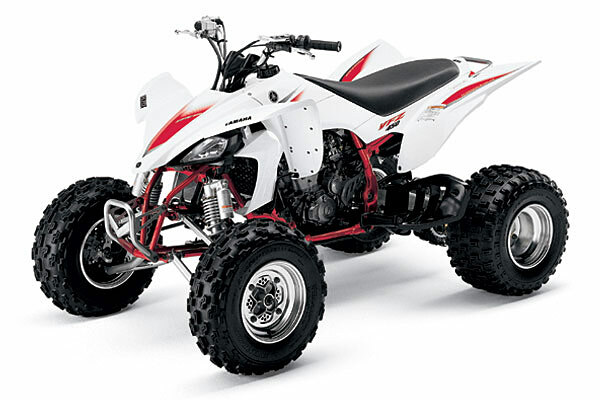 Honda by a .6*"
The Yamaha YFZ450 has a slight edge in this department as it has a 4.4inches of ground clearances and the TRX450R 4.2 Inches. "So we will give it to Yamaha"
You wont go wrong with either of these ATV’s. They both have there perks and any rider would want them in there garage or on the trails.